“就像复活节岛的人像雕塑，这个设计的设想是这样的，这些一百五十英尺高的现代女像柱将会呈现出一种安静的权威感，像是一道风景，同时也在默默地为人民服务，日以继夜、无论晴天还是下雪天都在所有的地形上传输电力。”想象一下，山峦起伏之间一座座或站或蹲或跪着的巨型雕塑一丝不苟地举着给你家输电的高压电线线，画面感如此强烈，忍不住感叹生活的美好。This design transforms mundane electrical pylons into statues on the Icelandic landscape.Making only minor alterations to well established steel-framed tower design, we have created a series of towers that are powerful, solemn and variable. 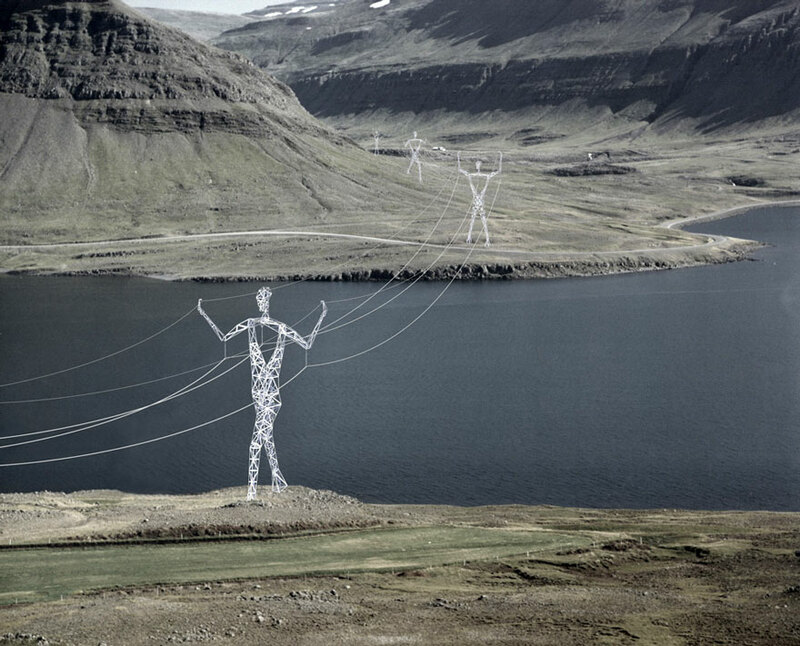 These iconic pylon-figures will become monuments in the landscape. 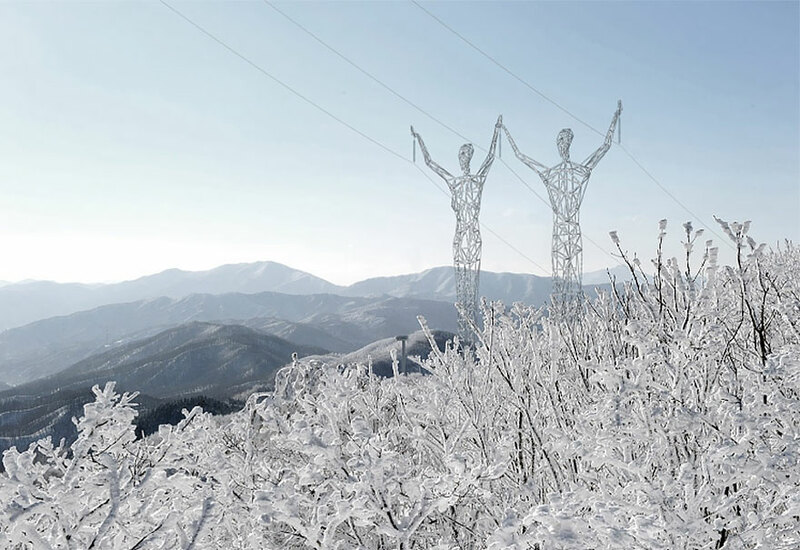 Seeing the pylon-figures will become an unforgettable experience, elevating the towers to something more than merely a functional design of necessity. 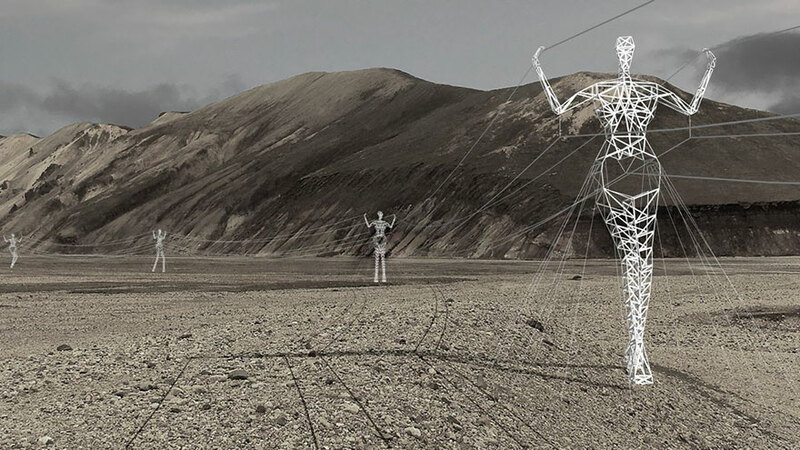 The pylon-figures can be configured to respond to their environment with appropriate gestures.As the carried electrical lines ascend a hill, the pylon-figures change posture, imitating a climbing person. Over long spans, the pylon-figure stretches to gain increased height, crouches for increased strength or strains under the weight of the wires. Despite the large number of possible forms, each pylon-figure is made from the same major assembled parts (torso, forearm, upper leg, hand) and uses a library of pre-assembled joints to create the pylon-figures’ appearance.This design allows for many variations in form and height, and the cost is kept inexpensive through identical production and simple construction. The pylon-figures can be achieved from the modification of existing lattice towers.The pylon-figures are designed to provide supports for the conductors, ground wires and other cables all within required clearances.These clearances are maintained in the various shown positions.The towers are largely self-supporting, sitting on concrete footings, perhaps with the addition of guy wires, depending on requirements of the loading wires. 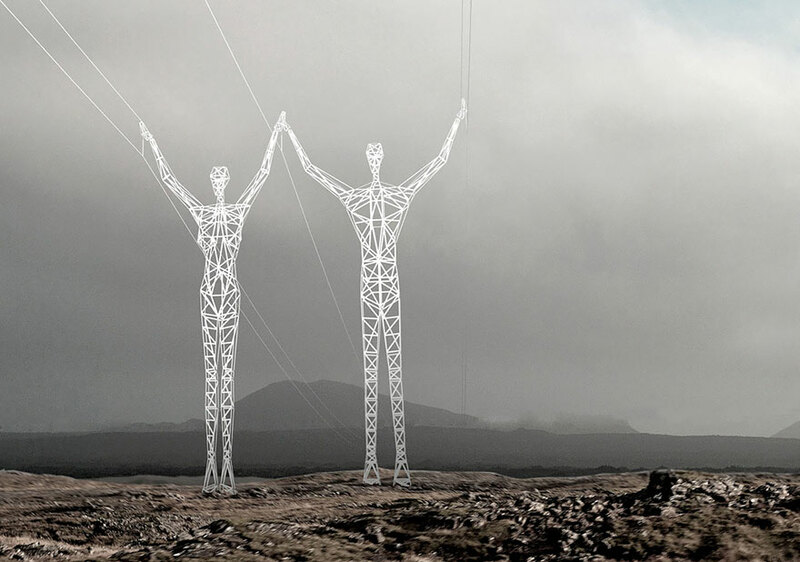 Each pylon-figure is composed of standard selection of parts with adjustable inter-connectors.A pylon-figure couple with a 30-meter lineheight and a 3-phase 220KV line.The pylon-figuresare assembled in large sections from the ground up, in the same manner as the existing lattice towers. 延伸阅读：风之巨人THE GIANTS OF THE WIND? 风之巨人创造了符合风力涡轮机运动的标志性，优雅的结构，将平凡的基础设施转变为景观上的动力雕塑。风是越来越多的绿色能源。然而，随着风力发电机的规模和数量的增加，风力发电机正在变得越来越主导。这个项目不是将风力涡轮机定位在视线之外，而是将这些地点变成旅游目的地。The Giants of The Wind creates iconic, graceful structure befitting the soft movement of wind turbines, transforming mundane infrastructures into kinetic sculptures on the landscape.Wind is a growing source of green energy. However, wind turbines are becoming excessively dominant on the landscape as their size and numbers increase. Rather than locating wind turbines out of sight, this project creates landmark, transforming the sites into destinations.